Ceiling fans, in my opinion, are a nice addition to your house. Know however, that a ceiling fan will not actually cool your house. All a ceiling fan will do is blow around whatever temperature air you already have in your house. The movement of the air over your skin has a cool feel to it, but that is caused by the movement of air. The indoor temperature of your air will not go down no matter how many fans you add. 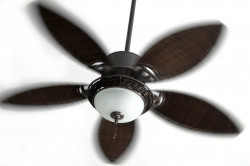 That said, ceiling fans will allow you to keep your house a little warmer in the daytime which is a money saving step. They will help blow the cool air supplied by your a/c around the room and in the winter will do the same with the heat. Get a fan (or fans) that have variable speeds and are reversible. In the summer they should turn clock-wise (forcing air down) as you look up at them, and vice-versa in the winter.